Often abbreviated as PNP, the Periyar National Park and wildlife sanctuary is located in the Indian state of Kerala. The national park covers an area of 925 sq kilometers with a core zone of around 325 sq kilometers. It is also known to some as Thekkady, and is known for its tiger and elephant population. Thekkady is located on the state border of Tamil Nadu and located high in the Cardamom and Pandalam Hills. The areas were first protected by the Maharaja of Travancore in 1934 and were later declared as a wildlife reserve post Indian Independence. Periyar National Park comprises of varying altitude which ranges from 1,700 meters to 100 meters above sea level. The highest point in Periyar is the Kottamalai which is 2,019 meters above sea level. The scenic beauty and the wildlife of Periyar make it one of the best places to visit if you want to experience nature at its best. Thekkady experiences a climatic variation like no other due to its location in the Western Ghats with varying altitude. Being located in the southern Indian coastal region Periyar experiences a moderate climate all year round with temperatures ranging between 15- 25 degrees and a heavy monsoon season. Periyar experiences two monsoon seasons from the South West monsoon in June till September. The 2nd monsoons from the North-West arrive in October and the showers continue till December. The months of august and September experience a heavy rainfall and is also closed due to breeding season. The best time to visit Thekkady is any time between the months of October and March, when the climate is the mildest with frequent showers from the North-East Monsoons. 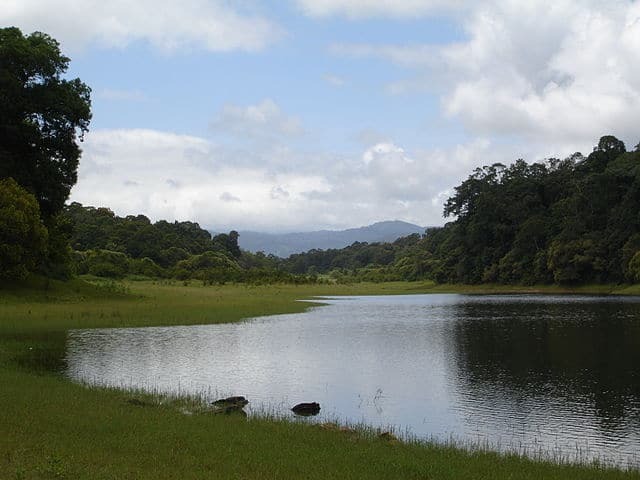 Periyar is known for its marvelous outdoors and the rare fauna it houses. It is one of the strongholds of the Royal Bengal Tiger and the Asiatic Elephant. Apart from these there are several species of animals, around 265 species of birds, 45 species of reptiles, 40 species of fish and 160 species of butterflies that can be spotted in Periyar. Animals – Bengal Tigers, Indian Elephants, Leopards, Sambhar, Indian Bison, Wild Pig, Travancore Flying Squirrel, Jungle Cats, Nilgiri Tahr, Lion-Tailed Macaque, Salim Ali’s Fruit Bat, Nilgiri Marten and Stripe-Necked Mongoose. Birds – Malabar Grey Hornbill, Nilgiri Flycatcher, Brahminy Kite, Great Hornbill, Crimson-Backed Sunbird, Nilgiri Wood Pigeon, Blue-Winged Parakeet And White-Bellied Blue Flycatcher. Other Birds Include The Black Baza, Spot-Bellied Eagle-Owl, Nilgiri Thrush, Little Spider Hunter, Crimson-Backed Sunbird, Nilgiri Wood Pigeon, Rufous-Bellied Hawk-Eagle, Sri Lanka Frogmouth, Oriental Darter, And Black-Necked Stork etc. Reptiles – King Cobra, Malabar Pit Viper, and Striped Coral snake, cobra, common krait etc. Nearest Airport – The nearest airport to Periyar is Madurai airport located in the neighboring state of Tamil Nadu. Cochin Airport is also very close to Periyar. Nearest Railway Station – Trivandrum railway station, Cochin Railway Station, and Kottayam Railway station are all in close proximity to Periyar and are well connected to all major railway stations in India. Road Accessibility – Buses and Taxis are easily available from all major cities in Kerala and Tamil Nadu. Madurai, Kottayam, Kumily, Ernakulum are all well connected to Periyar with regular bus services operating between them. Thekkady is visited by thousand of wildlife enthusiasts and is a center of eco tourism in India with its lush green surroundings in the Western Ghats Mountain range. Accommodations are easily available courtesy the Kerala tourism department. There are also other mid ranged accommodation and lodging facilities in Kerala and Tamil Nadu in the nearby cities of Madurai, Cochin, Kottayam and Ernakulum. The entry fee in Periyar National Park is nominal even for Indian standards. Rs 25 for Indian Adults, Rs 300 for Foreign Tourists, Rs 100 per person charge for cameras, Rs 250 per person charge for video cameras and Rs 50 if you plan to take a ride in a vehicle.